Lemon Meringue Pie is a famous traditional British dish and ranks amongst one of the great British Puddings. Sadly it fell out of fashion in recent years but I am glad to see it is once again back on the menu. 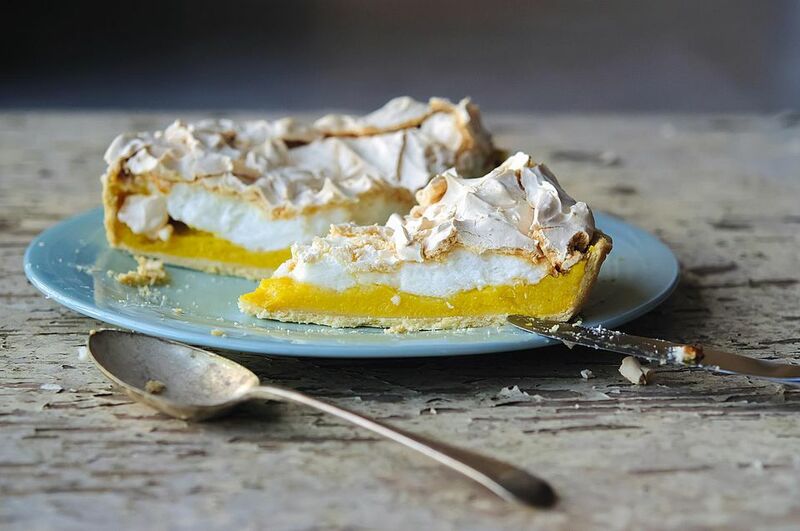 This Lemon Meringue Pie recipe is quick and easy to make. If you are in a hurry then use a shop bought tart case, but for the best results, nothing beats home made pastry. This is my recipe and it is very lemony as I like a strong tang. If you like less of a lemon flavour then reduce the lemon juice slightly and replace with water. In a medium saucepan mix the cornstarch/cornflour with the water, add the lemon juice and grated rind and slowly bring to a gentle boil, stirring constantly as the mixture begins to thicken. Once thick, add the sugar and stir well. Remove the pan from the heat and leave to cool slightly. Once cooled add the egg yolks and whole egg and beat well until all the egg yolk is incorporated, then beat in the softened butter. Pour into the prepared pastry case. In a clean bowl whisk the egg whites with either a hand or electric whisk until the whites are beginning to rise. Add the sugar, a couple of tablespoons at a time while still whisking, until half the sugar has been added. Add the cornflour, whisk again. Finally add the remaining sugar gradually, again while still whisking. You should have an extremely thick, glossy cream in the bowl. Pile the stiff egg whites onto the lemon filling beginning at the edges then filling into the middle. Lightly flick the surface of the meringue to create soft peaks. Bake in the center of the hot oven for approx 20 minutes or until the meringue is crisp and golden brown. Remove from the oven, leave to cool in the tin for 30 minutes, then remove from the tin and eat as soon as possible. Best eaten the same day. NOTES: If you want successful pastry every time, then check out my tips on making the perfect shortcrust pastry, it really is quite easy.